Dehydration is a serious condition for goats and can kill an untreated animal quickly. When the goat is losing fluids faster than their bodies are able to replace them, they are dehydrated. Goats that are under stress due to heat exhaustion, injury or illness, especially bouts of diarrhea, are losing water and electrolytes quickly. Suzanne W. Gasparotto, one of the developers of the Tennessee Meat Goat breed, explains in her article, “Dehydration: Deadly to Goats,” that any time a goat is off of water and feed, there is a good chance that it is suffering from dehydration. A 100 lb. goat needs a gallon of liquid each day, so it is imperative that goats always have access to clean fresh drinking water. 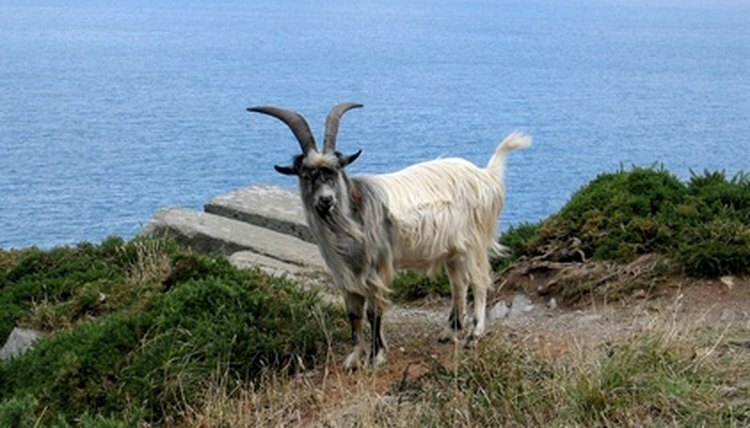 A dehydrated goat can appear weak or depressed. Your goat may not walk or play as usual and the head and ears may droop. The goat may also show no interest in eating or drinking. Give a fold of skin, along the neck or the back, a pinch and pull upwards then release. The skin of a hydrated goat will smooth back down almost immediately, while a the skin of a dehydrated animal will slowly smooth down. This is known as the skin turgor test and the lack of fluids in the goat will affect the elasticity of the skin. The longer the skin stays in position, a poor tugor test result, indicates a higher degree of dehydration. Sudden weight loss may indicate dehydration. You may notice protruding bones, most often the hips and the ribs. Changes in the goat's eyes may indicate dehydration. Specifically, the eyes may appear sunken, as if the they are receding into the socket. Eyes may also appear dull rather than shiny and bright. Check the goat's nose and mouth for changes in texture. If the goat is dehydrated, its nose and mouth may look and feel dry, and its saliva may seem thick or sticky. The gums may be a pale pink color rather than a rosy pink. They may be dry and when you push your thumb down on them and release, they may remain a whitish color for two or more seconds instead of quickly returning to their normal color. Goats that do not urinate may be dehydrated. In order to determine the extent of the dehydration, your veterinarian can run a complete blood count. This will indicate how much fluid the goat has lost. Gasparotto explains that if a goat is not drinking, then a stomach tube or sub-cutaneous injections, and sometimes both, are the only way to get an adequate amount of fluid into a goat. If you do not know how to do these procedures, and the goat has a poor skin turgor test or is not drinking, you need to consult your veterinarian immediately. Why Are My Goat's Horns Flaking? What Makes a Goat Not Chew Its Cud? How Many Kids Do Goats Have?